Rock Paper Lizard: Sleek bird. Brewer's Blackbird, one of the spooky-eyed blackbirds. I saw a Merlin today, a tough little falcon zipping past at rooftop level. I said to nobody, because I was with nobody, "Merlin," but couldn't raise an arm to point the bird out to nobody, because my fingers were tangled in the handles of plastic grocery bags, turning purple. I turned to watch the Merlin as it headed north over the neighbourhood. It disappeared into the crown of a distant Douglas fir. It probably kept flying, but out of my sight. Brewers Blackbirds are not as amazing as Merlins, but are easier to photograph. Not sure i've ever seen one. The blackbird, on the other hand, I've seen plenty of. 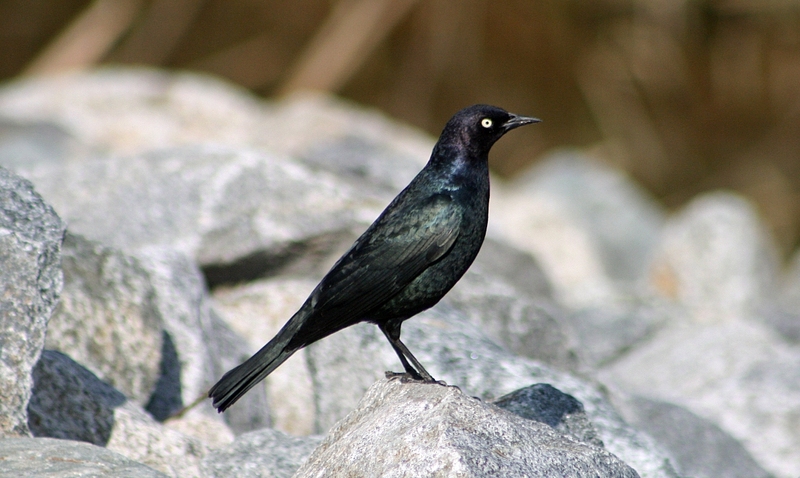 But they're a GREAT example of a bird that is very common yet SUPER gorgeous. Stunning. Nice to remember. bb: yes, they're super gorgeous. Super dapper. Thanks Karen, I hope you have a great day too.